Delicate on the sensitive skin it prevents irritations, itching and inflammations. 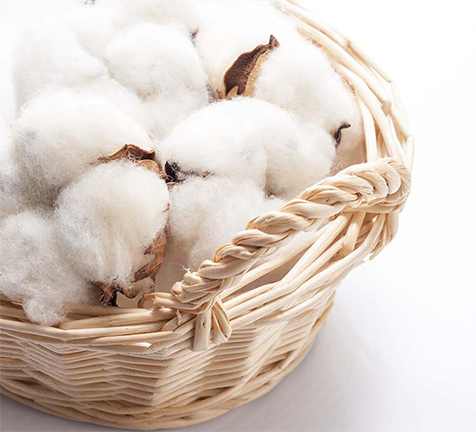 Called by the ancient Indiens “the white gold”, cotton has been considered, for thousands of years, the most important natural fiber. The purity of this material and its delicacy at the contact with the skin make the cotton be the most used natural fiber in the world. Cotton is the result of natural growth, without pesticides, chemicals or synthetic additives, that could be absorped in the blood flow. Is is considered, in other words, the safest and healthiest material that comes in touch with the skin. The pesticides and chemicals in conventional agricultures block the natural balance of the skin, impeding it from “breathing” (for example, the adequate moisture absorption), often leading to irritations, inflammations, exema. That is why cotton is grown by using methods and materials that have a little impact on the environment. “Work with, not against” nature is the principle behind ecological agriculture. Farmers base it on organic fertilizers, cultures rotation and they do not use pesticides or other chemicals. Fields are naturally fertilized, parasite insects are used to control, also naturally, crops damages, and weeds are taken away by shovel or by tractor. The Certifying Organization for ecological agriculture constantly verifies if the producers use only methods and materials allowed in the ecological production. The farms get their ecological label by using the soil that is free from synthetic pesticides for at least three consecutive years to go.